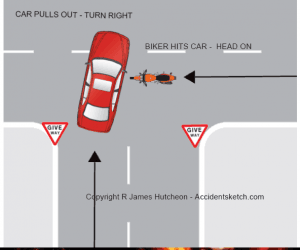 One of the most common accidents on the road involving a motorcycle is when a motor car pulls out of a side road at a junction into a main road. The motorcyclist has the right of way but quite often they will fail to be seen by the motorist. 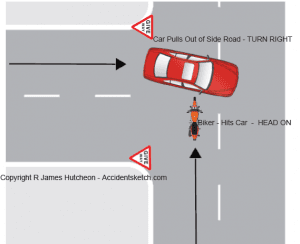 It is important that all motorists think “BIKE” when at a junction, but instead it’s quite often that the motorist pulls out and causes an accident. Should this occur, in the opinion of our motorbike claims solicitor Ronnie Hutcheon, there is a good compensation claim to be made by the motorcyclist against the motorist. However, there may well be blame on the motorcyclist or pedal bike rider as to overtake can also be risky. It is important that it is distinguished from another similar accident claim where the motorbike rider is overtaking a stationary or slow moving line of traffic. In that case, a Powel v Moody type blame will be raised against the motorbike rider claim. To learn more about the compensation service from R. James Hutcheon Solicitors, please speak with one of our specialist injury and accident advisors on 0800 011 2757 or 0151 724 7121 and we will discuss whether you have a case to pursue.